Our Circulon Symmetry Chocolate Cookware Set review showcases an 11 piece nonstick pots and pans collection that has a lot to love! The pieces included with the set are “every day” useful and the sizes are generous. I especially love the 3 quart covered saute. I have a similar pan, and I find myself using it at least 3 or 4 nights out of the week. Really… it’s that good. You’ve no doubt heard about tri or triple-ply construction with respect to cookware. This set is a bit different. The base is impact bonded stainless steel – super hard, safe on all surfaces and a great heat conductor (read: faster, easier cooking!). We’ll talk more about that technology a bit further into the review. The Circulon Symmetry set was designed with quality in mind. The base is impact bonded stainless steel. Impact bonding places a heavy gauge layer of aluminum between layers of stainless steel. This has two effects: excellent heat conduction, which can reduce the time needed to cook; and the ability to use less fats or oils while cooking, which is healthier. Impact bonded stainless steel is safe to use on any stove or cook top. The hard anodized construction is much tougher than stainless steel alone, while allowing for the best heat distribution. Better heat distribution leads to faster cooking times. The interior and exterior of the pots and pans have been coated with an advanced nonstick technology called DuPont Autograph. This is a 3 layer non-stick coating that virtually ensures no food sticking whatsoever. In addition, you’ll find the set has Circulon’s Total Food Release system. Total Food Release uses Hi-Low wave technology to further make sure no food particles stick to the surface. I’ll explain how this technology works a little further along in the review. 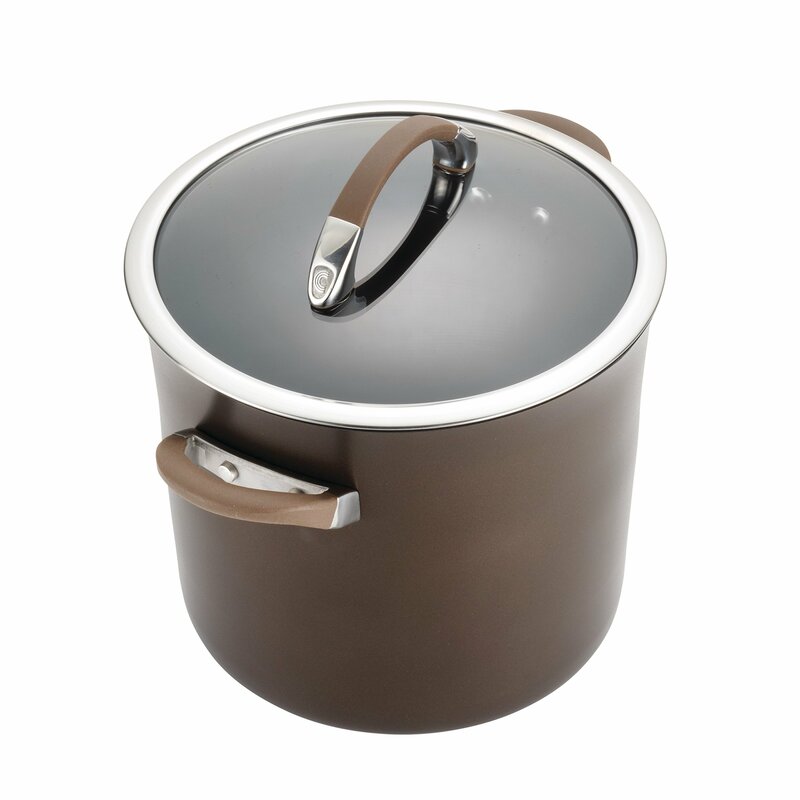 The handles are made of stainless steel that has been coated with silicon, so they will remain safe to touch during cooking. The set is finished off with tempered glass lids with stainless steel rims. The lids have a low profile and are easy to store. This is a beautiful set. The chocolate cover is very neutral, and is an incredibly trendy color right now. If you’d rather go with a classic style, this set is also available in black. The black pots and pans are actually a bit cheaper as well. The handles have what is described as a tulip design. 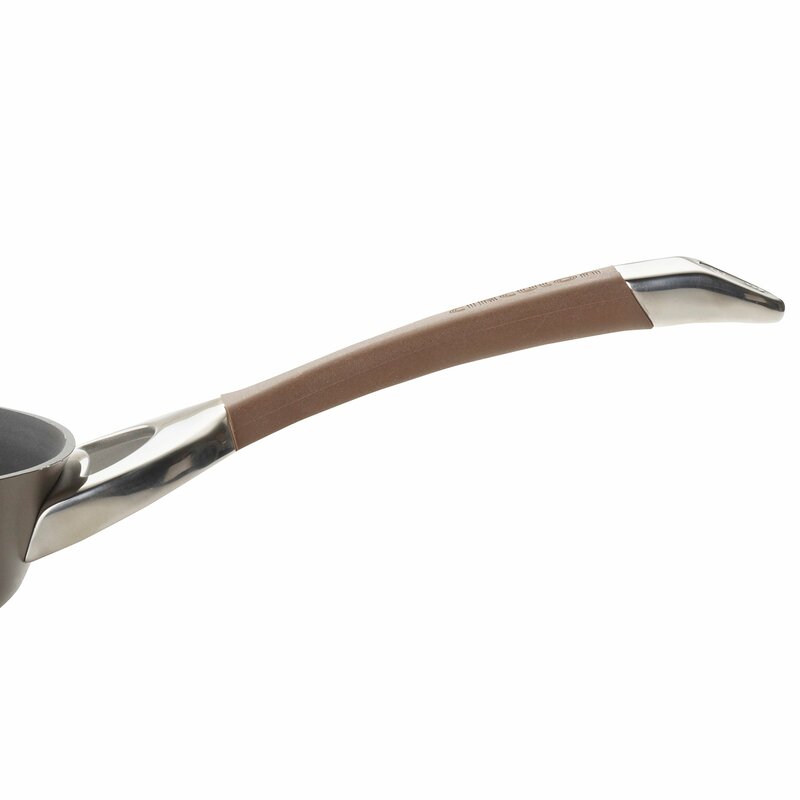 This can be found on other cookware sets, and seems to be a popular design right now. They are dual riveted for strength. The set is heavy and the metal thickness is good, comparable to other sets that are pricier. While they have a heavy weight, they’re not too bulky to handle. When you look in the interior of these pots and pans, you’ll notice small grooves on the bottom. This is Circulon’s Hi-Low wave technology, a part of their Total Food Release system. These grooves, in combination with the non-stick coating, help to keep food from sticking, while at the same time resisting abrasions. DuPont Autograph is the very latest in nonstick technology and uses three separate layers to ensure that nothing sticks to the cookware. In addition, the DuPont coating is also very abrasion resistant. Between the DuPont Autograph and Hi-Low Wave technology, the cookware is very scratch resistant, so it’s okay to use metal utensils with it. The set is oven safe up to 400°F. You’re probably not going to want to use these under the broiler, but they should be fine for most things you’d want to finish up in the oven. The set includes Circulon’s Lifetime Limited Warranty. They will replace any item that is damaged or defective with the exceptions of damage caused by misuse or abuse (including damage caused by oil, cooking spray or overheating). Also, any scratches, stains or discoloration caused by the user aren’t covered. This set has a lot going for it in terms of durability. First, hard anodized aluminum is known for its lasting power. It’s a tough metal and, when used properly, you can expect to get years of use out of it. Circulon has gone a bit further, though, in including the DuPont Autograph and Total Food Release systems. The non-stick coating and hi-low grooves also help to fight against scratches or abrasions, which will keep your cookware looking newer, longer. Circulon Symmetry is incredibly easy to clean. It is dish washer safe, and several reviewers pointed out that they’ve washed the set in the dish washer with absolutely no problems. The only issue that did come up a couple of times was that sometimes washing in the dishwasher leaves a filmy coating on the outside of the pots and pans. This can easily be rinsed off. 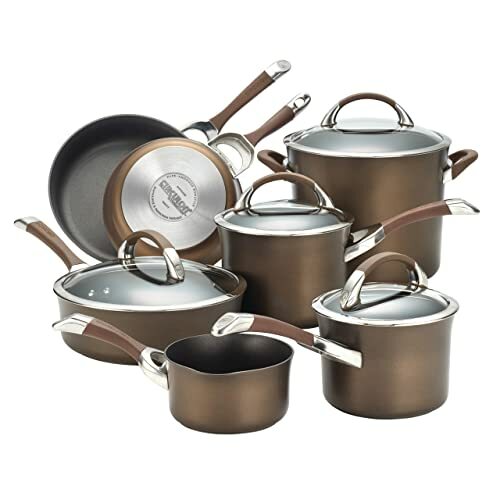 Since virtually nothing sticks to these pans, though, you really could just wash them by hand. A quick rinse with some soapy water is going to be all it takes to get them clean. Customers have really put this set to the test including washing the pieces in the dishwasher, using metal utensils while cooking and using on a variety of cook tops including induction and glass tops. In every case, the cookware held up and still looked and functioned like new. The price is a bit higher than some of the other sets available on the market, but it is still what would be considered a mid-price product. Many reviewers felt that the higher price tag was well worth the value they received in this set. Especially considering that many thought the set was just as good as some of the pricier brands. One of the interesting comments I read while researching the Symmetry set is that the pots don’t tend to boil over. A feature I would just *love* to have. I don’t know why this is, but someone suggested that it’s the way the lids fit onto the pots. 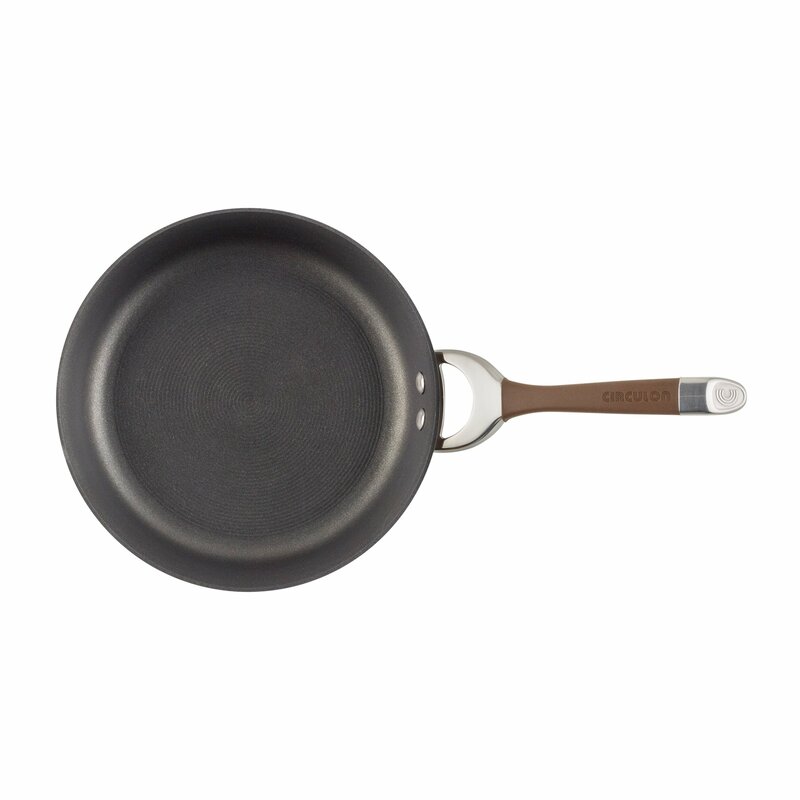 Over and over customers raved about the non-stick quality of this cookware, too. Nothing sticks to it – absolutely nothing. I’m sure we’ve all had “nonstick” cookware that still needed to be soaked for hours after something stuck, lol. Apparently, that really isn’t the case with this set. Customer service is something that shouldn’t be ignored, either. Circulon really does stand behind their products. One reviewer had an issue with a damaged piece, and not only did Circulon quickly replace it, they didn’t even require a return of the damaged item. That’s fantastic service!